In 1977, The Dirty Dozen Social and Pleasure Club in New Orleans began showcasing a traditional Crescent City brass band. It was a joining of two proud, but antiquated, traditions at the time: social and pleasure clubs dated back over a century to a time when black southerners could rarely afford life insurance, and the clubs would provide proper funeral arrangements. Brass bands, early predecessors of jazz as we know it, would often follow the funeral procession playing somber dirges, then once the family of the deceased was out of earshot, burst into jubilant dance tunes as casual onlookers danced in the streets. By the late ’70s, few of either existed. The Dirty Dozen Social and Pleasure Club decided to assemble this group as a house band, and over the course of these early gigs, the seven-member ensemble adopted the venue’s name:The Dirty Dozen Brass Band. 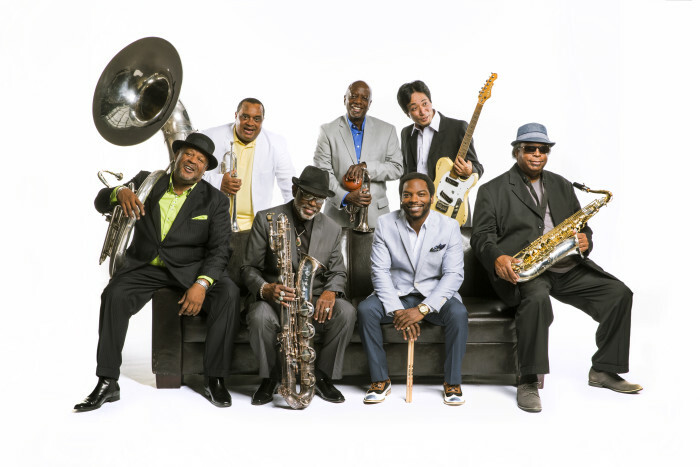 Thirty-five years later, The Dirty Dozen Brass Band is a world famous music machine, whose name is synonymous with genre-bending romps and high-octane performances. They have revitalized the brass band in New Orleans and around the world, progressing from local parties, clubs, baseball games and festivals in their early years to touring nearly constantly in the U.S. and in over 30 other countries on five continents. The Dirty Dozen have been featured guests on albums by artists including David Bowie, Elvis Costello, Dr. John, Widespread Panic, Modest Mouse, Dave Matthews Band and the Black Crowes. In addition to their Mainstage set, the band will participate in a free late-night jam at Fassler Hall from 10:00-midnight.